Lack of volume and thinning hair due to ageing? Hair is an integral part of woman’s identity, enhancing beauty and femininity. You surely wondered countless times how to have voluminous, full-bodied and thick hair, always shining, despite the passing of the years. 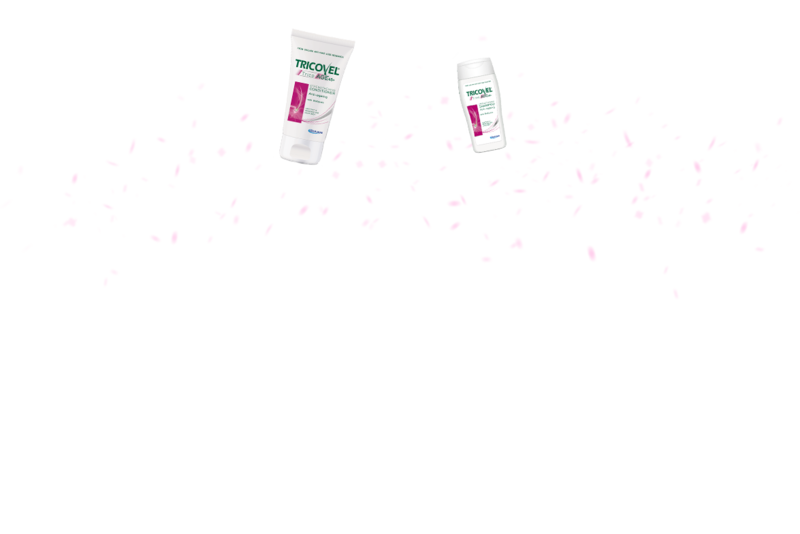 Result of Giuliani Anti-Hair Loss Research on female hair, Tricovel® TricoAGE 45+ is the innovative line designed to counteract the signs of time on hair. 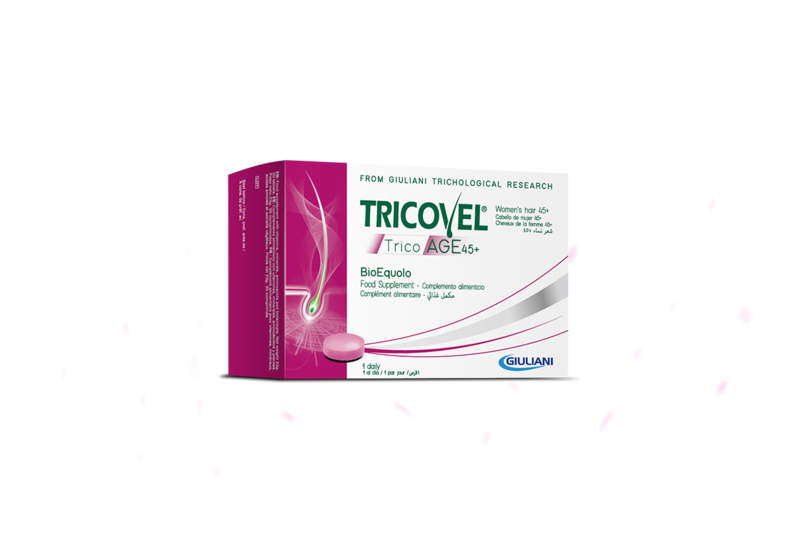 Ideal anti-ageing line for hair in peri– and menopause, Tricovel® TricoAGE 45+ helps to keep it bright, thick and full-bodied even after 45 years of age and it is composed of a food supplement in tablets, vials for application on scalp and cosmetic complementary products. Thinning, weaken, dull and not voluminous hair: advancing ageing and the physiological changes associated with it can transform women’s hair. These changes affect hair quality, especially during menopause and in the period leading up to it, when estrogen deficiency can alter the life-cycle of hair. The fibre becomes thinner and weaker, the production of sebum and lipids decreases: the result is that hair volume and brilliance decrease, fibre grows more fragile, dryer and thinner, tends to break and becomes more difficult to comb. How to have full-bodied hair over the years? How to make hair bright and seductive? Tricovel® expertise has led to the creation of the new TricoAGE 45+ line, specifically designed for the needs of ageing hair. The effectiveness of its formulations is determined by the action of the unique BioEquolo, a patented complex of natural origin consisting of Fermented Soy and Ajuga Reptans, Pantothenic Acid and Biotin, essential vitamin for hair health. 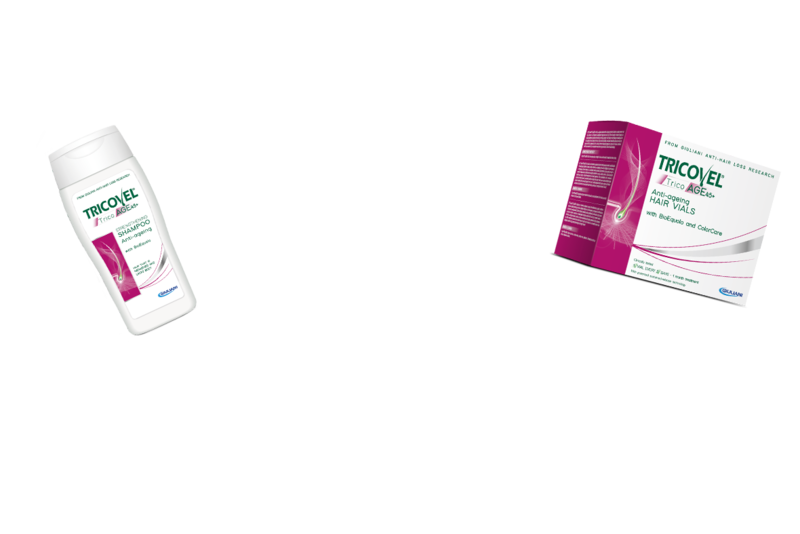 TricoAGE 45+ Tablets acts on hair from within with selected nutrients, while TricoAGE 45+ Vials is an adjuvant treatment that provides anti-hair loss and anti-ageing action on bulb from outside. The line is completed with TricoAGE 45+ Strengthening Shampoo, Conditioner and Mask, that with strengthening and anti-ageing system to restore volume, density and vitality to the fibre, integrate the action of the tablets and the vials.